Patrón Highcroft's "Scottish Terrier" was not about to give up without a fight - Franchitti hounded Smith for 17 laps before the Mazda made its final pit stop, giving Highcroft back the lead. Five laps later, Franchitti made his final visit to the pits - the team electing to double-stint its Michelin tires. The fuel-only stop enabled Franchitti to retain the lead and with 41 minutes remaining, the reigning American Le Mans Series LMP1 champions enjoying a 37 second advantage. Franchitti's performance on his original tires remained strong and after 16 minutes, Smith was still trailing by 26 seconds. However, with 24 minutes of the race remaining, Patrón Highcroft Racing's ninth American Le Mans Series presented by Patrón class victory and sixth overall win was virtually confirmed after their rivals at Mazda suffered a mechanical issue ending their race. Franchitti was then able to cruise to the finish to take an incredible victory by an enormous seven lap margin. The is the second in a row for the team after a thrilling final-lap win on the streets of Long Beach. For Simon Pagenaud, it also represents his third sportscar win in a row after he also took victory for Peugeot in the recent Le Mans Series event at Spa-Francorchamps in Belgium. Today's victory was Brabham's 21st American Le Mans Series victory and his sixth overall victory for Patrón Highcroft Racing. 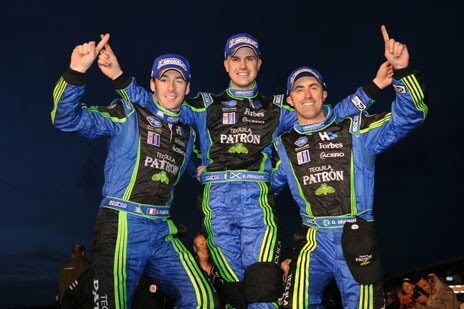 Pagenaud scored his second victory in Patron Highcroft colors and his seventh ALMS win. Today's win was also the first overall Series victory for Marino Franchitti in the American Le Mans Series and his second consecutive podium finish for the team in just two starts. 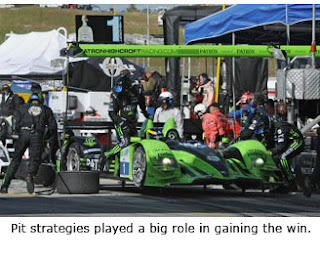 Patrón Highcroft Racing also won the LMP portion of the MICHELIN® GREEN X® Challenge, based on overall performance and environmental efficiency. 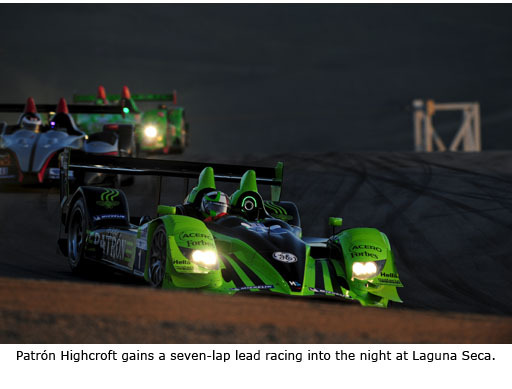 Mazda Raceway Laguna Seca continues to be a happy hunting ground for the team with today's win adding to last season's championship-clinching success at the famous California track. Patrón Highcroft Racing has now taken a four point lead in the championship after finishing second in the LMP2 class at Sebring and completing back-to-back wins. The team now faces another battle - a busy week-long race to prepare the team's HPD ARX-01c for the 24 Hours of Le Mans. The team's transporters will leave for its Danbury, CT-base tonight with the car leaving for France by the end of the week. MONTEREY, CA, Saturday, 23 May, 2010: Patrón Highcroft Racing took its second victory in a row with a brilliant "last to first" win for David Brabham, Simon Pagenaud and Marino Franchitti at the six hour event at Mazda Raceway Laguna Seca today. After being put to the rear of the grid by race officials for a minimum driver time infringement in practice yesterday, Simon Pagenaud made a barnstorming start aboard the Honda Performance Development factory-backed HPD ARX-01c - charging through the field to be 20th after one lap, 13th after two, seventh after three and through to fourth and on the tail of the leading LMP class pack in four laps. He recorded his fastest lap of the race on lap five and was right back in contention at the first safety car period on lap nine. Pagenaud moved to third on lap 34, inherited second on lap 39 after Clint Field blew an engine and then lightning pit work by the Highcroft squad cycled him through into the lead at the first stop on lap 54. On lap 95, the Frenchman pitted to hand over David Brabham who continued the team's dominant form at the front. He lost the lead to the Dyson Mazda of Andy Meyrick after his mid-stint round of stops, but regained it after a yellow flag restart when the young Brit spun on the green flag. With two hours to go, Brabham handed the car over to Marino Franchitti for the run to the flag. "However, 13 laps into his stint, the Mazda with Guy Smith at the wheel used its straight line speed advantage to pass Franchitti on the front straight and steal the lead. With Pagenaud competing in the LMP1 class for Peugeot, Brabham and Franchitti will be joined by three-time Le Mans winner Marco Werner for the French endurance classic. Piper Fit test at Buttonwillow Raceway Park, March 15 and 16, 2010. For our second trip to Buttonwillow, we had a busy agenda. Shake down the new Fit-powered Piper, test some restrictors and put 500 more miles on the Fit engine. Unlike in December, the weather was perfect for testing, with a low of fifty degrees and highs in the eighties. The engine was the same as the one tested in December. It had 2,150 miles on it (270 miles from December, the rest in dyno ECU testing). As in December, we had the help of Robert Podlesni, who handled the driving chores. Monday was spent getting Robert and the Piper set up; we ran the Goodyear 160 compounds from the first test for the shakedown. Special thanks to Dan Campbell at Vestal race cars for letting us sneak onto his set-up pad. After lunch, we were confident the car and Robert could be consistent and installed a new set of Goodyear 430 compound tires. As we attempted to get some restrictor testing in, Robert reported the fuel pressure rising, so we asked Robert to monitor it. After five more laps, he came in and said the pressure was higher, and that the engine was losing power. We decided to install another set of injectors and this cured the problem. After returning to HPD, we gave the suspect injectors to our materials lab, which confirmed we had clogged two injectors. Researching at HPD, we found debris in the fuel cell and discovered the inline filter was not the specified filter size. We informed our customer representative, Julian Macias, and he alerted our customers that we would be shipping them a new filter. With that under control, we ran some more laps and Robert reported all was well. We ended the day with 134 miles. With everything working properly, we felt confident for Day 2. Day Two dawned bright and sunny. We installed the new tires and ran some laps to get a baseline on the 27.5 mm restrictor. After four timed laps, we installed the 28.5 mm restrictor and sent Robert back out. One-point-three seconds quicker! We added some fuel to bring it back to baseline and installed the 29.5 mm restrictor. This gained us another three-quarters of a second. Crew chief Troy McCall pointed out that the engine sounded better on up shifts, not as lethargic as with the 27.5 mm unit. Robert confirmed this, stating “the engine has come to life. The torque and top end are there now”. However, this still left us a second behind the Vestal on the day. With no more restrictors to test, we asked Robert to perform his standard marathon driving duties, which he did flawlessly. We did three 45-minute stints, followed by a 30-minute run to close the day. We ended the second day with 310 miles, and 440 total. Pretty good test.